Best Album: Taamu – Benny Friedman. 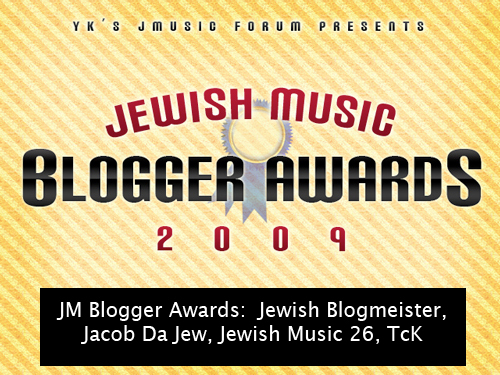 Best Song: V’hi Sheamda – Yaakov Shwekey. Solid song with excellent arrangements and a fantastic bridge. Best Yiddish Song: Emes – Benny Friedman. Emes is one of the best songs in a while. It features r&b hip hop flavor with great lyrics and a fantastic arrangement. It’s not over the top and it gets the point across. Best Album: A lot of new titles. Seriously. I’ll have to go with the one I listened to the most: Malei Olam by Shlomo Katz. Best Song: I can’t help it. The song Bye Bye Bye by Shua Kessin stuck in my head for the longest time. It didn’t help that my kids loved it too and were asking for the song to be played. Alot. Best Debut Album: Ta’amu by Benny Friedman. Quite simply, it was different yet familiar. Best Choir Album: Its not my fault. I’ve tried to steer my kids to listen to other music. But they simply insist on the new Yeshiva Boys Shmoy. I’ll take their word for it. Best Album: Avodas Tzedaka – Shloime Kaufman. I think this was a nice addition to jewish music, and most of the songs on it are really nice. Looking forward for more to come! Best Song: V’hi Sheamda – Yaakov Shwekey. Hands down! (Although Eshes Chayil by Yaakov Chesed was also another choice for me!) This was an inspiring song which I couldn’t stop listening to! I was hoping that it would make it to the list. Best Debut Album: (This was a tough one) Shua Kessin – Lo Lihityaesh. I loved it. Besides sounding so well on CD, he sounded just as well in person! Best Arrangement: No Vote. I have not yet listened to all of them so I can’t vote. Boys Choir Album: Yeshiva Boys Choir – Shmoy. Eli Gerstner once again did a great job in this one! Shmoy was definitely a good choice for an intro! Best English Song: Generations – Shua Kessin. The words of the song, and the story are beautiful! Best Yiddish Song: Emes – Benny Friedman. Great song, and nice words! Best Concert DVD: No Vote. I have not had time to watch all of them yet.